Having a fire pit for your outdoor space is a great way to spruce up your outdoor space and really maximize your time outside. Even though it is spring right now, the weather can still get a bit chilly at night. What better way to fully enjoy the outdoors and make sure entertaining late into the night will be comfortable for your guests than to add your own own fire pit! A great way to de-stress and take some time out of the day to relax is at night lounging in front of a cozy crackling fire. For tiny home owners, it is a luxury to have an indoor fireplace. One great way to have your fire place is to have an outdoor fire pit. Not only does it go hand in hand with tiny living, it utilizes the outdoors as an extended living space. In addition, adding a fire pit to your outdoor space is great for entertaining large amounts of people without feeling cramped. A fire pit offers a pleasant ambiance that allows your guest a place to gather, share stories and roast delicious snacks! This lovely fire place is sold at Home Depot and is lightweight, easily transportable and contains a spark screen to put on top of the fire bowl to assist in keeping the embers contained. The pit is raised above the ground on four arched legs and is supported by a diameter ring. It is made out of steel and comes in the color black. The dimensions of this fire pit is 25.8 in (depth), 25.8 in (height), and 19.9 in (height). 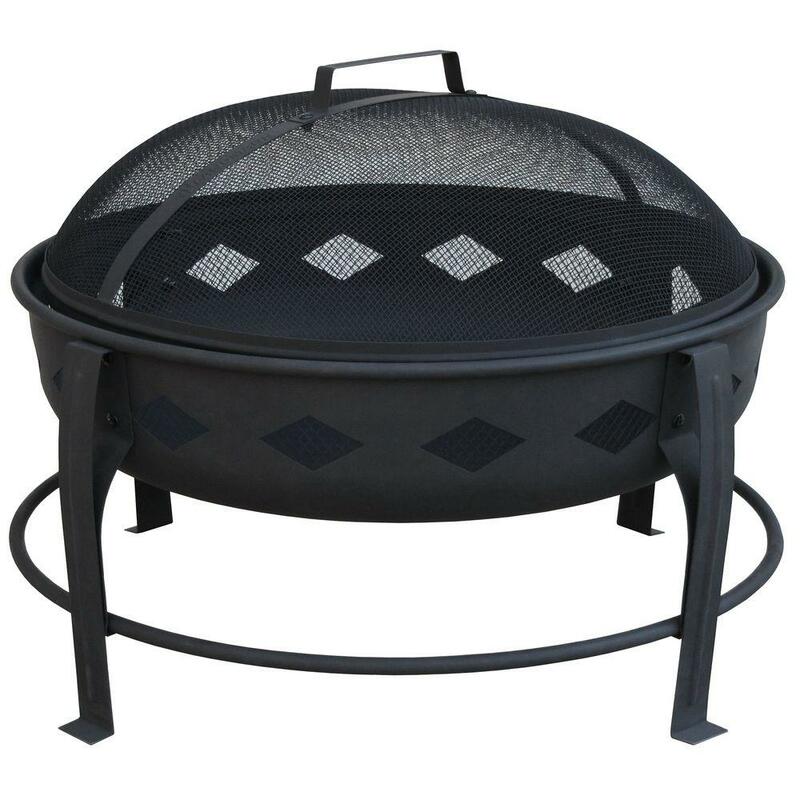 With its modern, sleek design, this fire pit will upgrade any outdoor space. 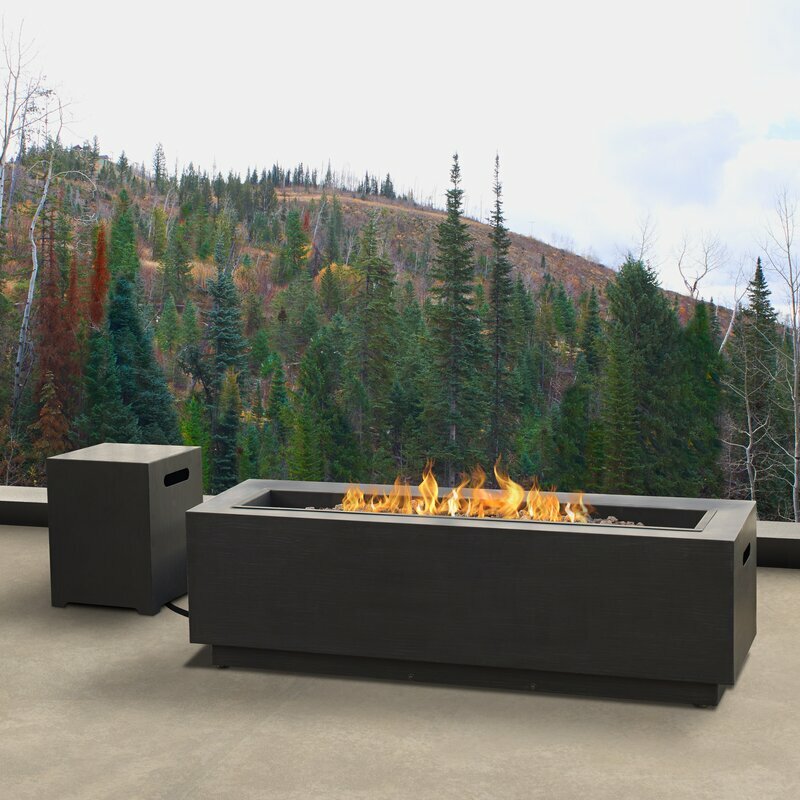 From Wayfair, this fire pit option emits 65,000 BTU’s of heat and the gas line is hooked up to the source of fuel on the outside of the table. Even better, there is a gas conversation kit that is included with fire pit. It is made of grey steel and can burn up to 6 hours and can be electronically controlled. The dimensions of this fire pit is 5” H x 48” W x 15” D.
This wood burning fire pit is a traditional piece with a modern twist. The rounded lattice design edge gives the look a more contemporary style and allows for the flames to warm your legs on those chilly nights. This fire pit is made out of heat resistant steel and comes with a fire poker to stir up those logs when the fire is dying down. The dimensions of this pit is 30L x 30W x 16H in. 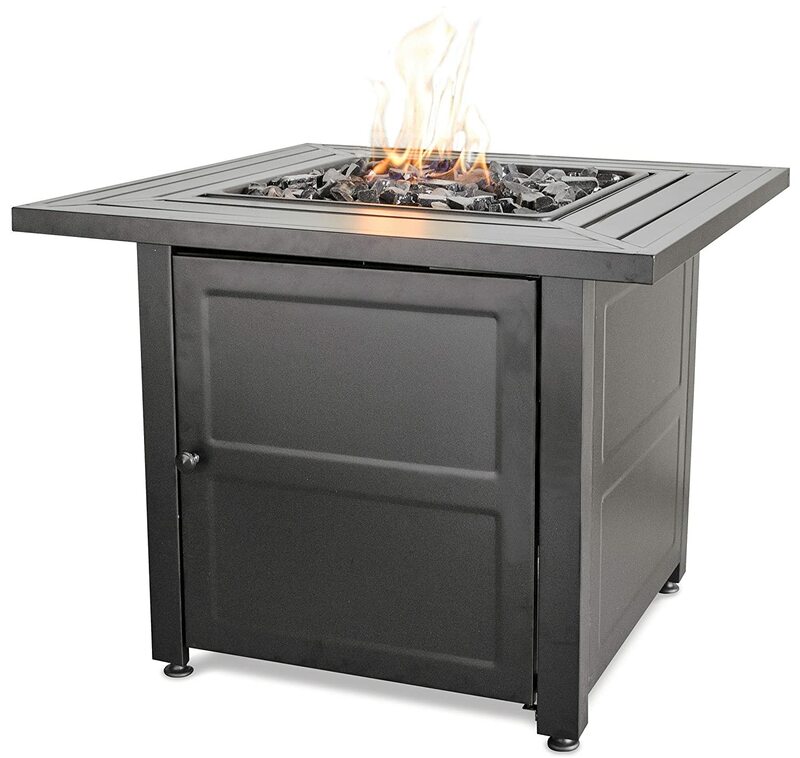 Hailing from Amazon, this unique fire pit is gas burning and has a wide designed base to conceal a propane tank and control panel. With its lovely squared mantel that wraps around the fire pit, it adds a touch of elegant and classiness that will make your outdoor space feel refined. Made with steel and powered with a 30,000 BTU stainless steel burner, this fire place is a great option for those looking to entertain and not worry about the ash produced by wood burning fire pits. Even better there is a 1 year limited warranty that is included. The dimensions are 30 x 30 x 24.41 in. For those looking for a challenge and interested in saving some money, building your own fire pit might just be the perfect solution. 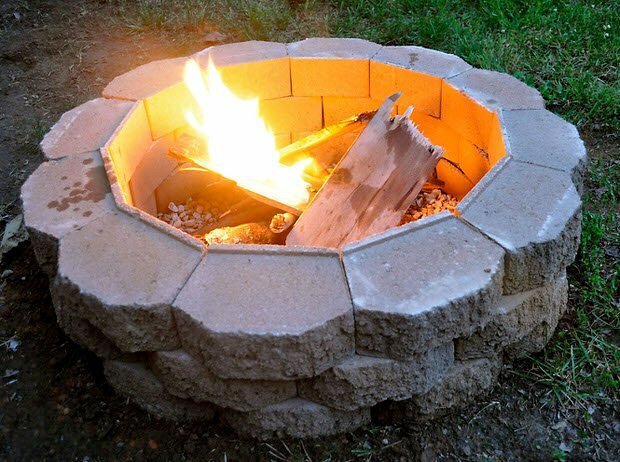 This awesome post guides you step by step on how to DIY the fire pit of your dreams. From measuring out how deep you want your hole to be to stacking the stone to mark your pit, this tutorial is the perfect way to make sure you are getting the fire pit you want. Not only will you save some money, but it is also a great way to customize the shape, size and material you want for your fire pit. Fire pits are absolutely brilliant. And you are right, they make entertaining easy. The flames provide all the entertainment, and sitting around a fire makes conversation easy. I’d never heard of s’mores, so I looked it up. I have a Canadian girlfriend coming this weekend, so guess what we’re going to be having for desert around the fire pit. We don’t have Graham Crackers here, but I believe our wheatmeal biscuits are the closest thing. She’ll love it.